It’s that time of year when writers, producers and even the casts of hit TV shows finally have free time to do publicity and attend cons. Recently, George R.R. Martin took a break from writing—as he is wont to do—and reportedly appeared at an even for author Joe Hill. Fans asked the Game of Thrones producer and sometimes writer about his Song of Ice and Fire Book series—as they are wont to do—and received a surprising answer about the HBO drama’s Hodor plotline. 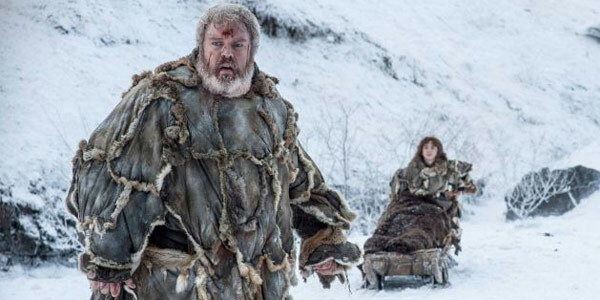 Namely, Hodor’s story in the books will not play out in the same way that the TV show does. The recent Joe Hill interview mostly featured George R.R. Martin asking the other prominent author questions, but he apparently also answered some questions while Hill was signing books. During this Q&A, Martin allegedly said that in A Song of Ice and Fire the name will have the same “hold the door” meaning. However, he has re-written the story so that the reveal will come about in a different way in the book series. It should be one of a few different changes that book readers will get moving forward. The news comes from a Reddit thread, but George R.R. Martin was recently promoting a Joe Hill event, so it’s not a completely ludicrous story even if we don’t have the quote directly from the author’s mouth. The report also indicates Martin does blame himself a bit for the show catching up with the books, a sentiment he has also expressed in the past. HBO’s fantasy drama has made a lot of changes from the show over the years. Stannis, for instance, is still alive in the books while he was killed off during Season 5 of the TV series. A slew of other changes have been made between the books and the series, including Sansay marrying Ramsay—which at least hadn’t happened in the books, yet. There are also characters like Young Griff or Lady Stoneheart that have never even been introduced on the HBO show. So, the changes definitely go both ways. Still, what HBO's fantasy adaptation generally gets right is telling a compelling story filled with complex characters. During Season 6, we've seen Sansa do some plotting of her own, for instance, and Dany conquer a large group of Dothraki. Despite a few minor flubs, a lot of the reveals this season have been really satisfying, and it is good to know that George R.R. Martin worked with showrunners Dan Weiss and David Benioff ahead of time so that the TV show complements Martin's ideas for his book series. To find out what else Game of Thrones has coming up, check out what we know about the upcoming episodes. Or simply catch new episodes on Sunday nights at 9 p.m. ET, only on HBO.